The time is almost here, tomorrow I fly to London then on to Australia. It is always a very difficult decision when working internationally to decide when to leave one country and to move to another. Based on the fact that it is a long way and expensive to get from Morocco to Australia I decided to look for a job in Asia, somewhere closer to Australia. In doing so, it would give me the opportunity to see my mother more often while she is still fit enough to appreciate it. When I get back this time it will have been 18 months since I have visited Australia. So after I visit Australia for one month's holiday, I am off to Dhaka, Bangladesh to work. Am I sad about leaving Morocco? Absolutely as it is a great place to live and work most of the time. It is safe, the people are friendly and I have made some good friends here. It is also a good stepping off point to Europe and other parts of Africa. But I still haven't mastered Arabic or French! Having said that I hope to be back to visit Morocco and I also hope to return to Africa to work at some stage. So this blog mightn't come to a complete end now, but instead I'll post less often. I also hope to start a blog about life in Bangladesh, and when I do I will put a link to it on this blog. More attempted abstract cacti photos!! While in Marrakesh I took my friend to see the spectacular Majorelle Gardens. This second visit was not enough, after she left I went back for a third visit. Actually this one was a research visit for a potential travel article. It was also the coolest outdoor place in Marrakesh on one of the forty degree days. In the cafe they had mist sprinklers around the edges, which must have dropped the temperature by more than 10 degrees. Made the relatively expensive prices for food and drinks worthwhile. Oops, forgot to photograph the cafe! But here is a reminder of the gardens anyway. What has been added to the gardens since I was there last is a memorial to Yves Saint Laurent after his death on June 1st 2008, who bought and restored these gardens in the 60s. He had a villa next door in which he spent a large amount of his time. In the dappled shade of the banana trees is what loks like a Roman column on top of a terracotta base. This quiet oasis in the Marrakesh mayhem is an ideal place to sit and remember one of th best known French designers. After this I decided to try and take some artistic photographs of the cacti, not that I am a very artistic person! Here's one. The Ourika Valley was one place I hadn't seen in Morocco until the last couple of weeks. It is a very picturesque valley coming down from the High Atlas Mountains and relatively close to Marrakesh, only a 45 minute drive away. The valley has steep mountainsides, a bubbling stream running down the centre of the valley that is bordered by green fields of crops. Cooler than Marrakesh (not hard when it has been 43 or 45 degrees for the last few days) and an attractive peaceful environment it is an ideal destination for day trippers. There are lots of cafes and restaurants scattered along the valley edges to cater for these visitors. In addition there are also many hotels and auberges for visitors who want to stay overnight. I can imagine it would be a very peaceful place then, once the day trippers go home. It certainly is picturesque with th buildings being forced to be built on the stepp mountainsides, often painted very colourfully or decorated in an ornate way. Located 24 kilometres up the valley is th pilgrimage site of Setti Fatma. here an annual festival is held at the shrine or Koubba of Setti Fatma. Not when I was there though. We returned directly along the Ourika Valley to Marrakesh, however to enter the valley we followed the piste (dirt) road from Imlil , winding through the mountains, past earthen housed Berber villages and road excavation. We also passed turn off to Oukaimeden, Morocco's main ski resort, which is reached by following the Ourika Valley. Travelling the piste road gave the opportunity to see some stunning mountain vistas. Unfortunately photographs can not give the scale and grandeur of these views. so high were the mountains that the villages looked like they wre made from brown paper-covered matchboxes. Juniper grew wild in many areas of these mountains - Red Juniper, Spanish Juniper or Prickly Juniper. Here is an attempt to depict these stunning views in the photograph below. I have just spent a two weeks down south again, around Marrakesh. First met an Australian friend who had never been to Morocco and showed her some of the sights of Marrakesh plus did a day trip to Imlil and Ourika Valley. So I got to see some things I hadn't seen before. Here we are at the Bahia Palace in Marrakesh. Then I spent a few days in Essaouira, always a good place for R & R. It wasn't any different this time as I managed to fit in a couple of siestas. Such a tough life. At least this time I did manage to get the photo that typifies Essaouira - the medina through the circular hole in the ramparts. After that just spent a couple more days in Marrakesh, and survived the oven-like heat Something like 43 degrees Thursday and 45 Friday. Hot, that is for sure. Even made the 30 degrees and high humidity of Rabat seem cool. I will do a couple more posts on specific aspects of the trip. Here is a movie of the Ben Youssef medersa, my favourite place in Marrakesh, but I think I need a little more practice at taking movies on my digital camera!! I haven't been able to upload it yet. Will try again tomorrow. 1. Electricity has and still is arriving. The metal pole structures to hold up the wires are carried in on mules in pieces, then put together by hand. A couple of hours walking can take you from one village that has electricity to one that has to wait a little longer. The result: Once bare flat roof-tops are now dotted with satellite dishes so people can watch TV. Will this change the lifestyle? Probably but only time will tell. 2. The construction of more roads into the mountains. Traditionally Berbers have travelled the mountains on narrow, winding trails by foot or on mules. Now the roads, unsealed of course, enable motorbikes, 4 WDs and small trucks to travel from village to village, although not all villages have road links yet. The effect is seen most on the change in farming. The traditional crops of barley and corn are being replaced by cherry, apple and plum trees. Fruit from these trees is taken to markets in nearby towns and sold, and the money gained is then used to buy the staples such as flour, sugar from the same markets. It has become much easier to transport thee goods back to the villages with the presence of the roads. 3. Not quite so recent but still in the last 5 years, an effort has been made to built schools so the Berber children can have access to an elementary/primary education. Up until this time, young children went to the Koranic school at the local mosque, while a few of the older ones may have walked long distances to get to school. 4. Tourism has been around for quite a while, but the numbers are increasing, especially since the budget airlines started flying into Marrakesh. This means the Berber people have a greater exposure to western ideas and culture. Today the access to TV is probably doing the same thing. On the other hand, the presence of tourists puts money into the local economy through staying at houses, hiring guides and mules and buying goods. Mules are an essential part of life for the Berbers in the mountains. For centuries they have been the mainstay of transport of both goods and people. However, the introduction of new roads into remote mountain valleys, to remote villages is changing this today. On our hike in the mountains, we met mules carrying cherries to market, mules carrying building materials but mostly mules carrying the luggage of tourists as they hike the trails. Part of the trip involved us travelling on mules rather than walking so as to reach the destination faster. Although I didn't plan to ride a mule, I had to as the muleteers wouldn't leave until they had someone on every mule. I found riding the mules quite a relaxing way to travel - just sit back and admire the view and the other hikers sweating away. I named my mule "Speedy Gonzales" as it was always trying to get further ahead and wanted to be at the front but had to stay at the back. Fortunately I got to walk not along after we started down, as someone else wanted to ride my rule. Most of the mules have embroidered saddle frames and colourful hand-woven rugs below the saddles. Some were friendly, some were not. Some were calm, some were agitated. Some walked along the centre of the track, others close to the edge. I spent most of last week hiking through the High Atlas Mountains with a group of students. Tiring? Yes, but the stunning views made it all worthwhile. The fact that 12 and 13-year olds could appreciate the stunning scenery was amazing in itself. We did go up and down the winding mountain-side trails, often with steep drops down to the gullys below. Through traditional Berber villages with their flat roofs and mud and straw construction. The houses are also built up on the mountainside above the gardens and terraces that are placed as close as possible to the water in the valley's flowing stream. Aged, huge walnut trees often shaded the path, their nuts still a green "blob" on the tree. The cherry trees were loaded with red fruit, while the apples and plums were still growing. Corn and barley grew on the terraces with much of the barley in the process of being harvested. We passed mules loaded with wooden boxes of cherries, "grass ladies" - a woman surrounded by a huge cape of freshly cut grass cur from near the river and then taken to feed the animals, young boys shepherding a herd of goats, women herding cows and even a crazy tourist cycling the mountain tracks. On Friday night I finally got to see it. It is small but definitely green, so I can leave Morocco saying I have seen it. Even then, not all the people watching saw it, so fleeting is the glimpse of green. Where was the green flash??? Last night I went to a farewell party for some friends out at Temara Beach. 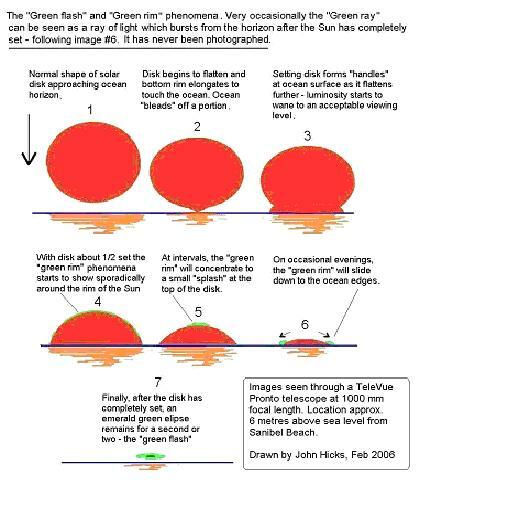 It was probably my last opportunity to see the famed, but hard to see, "green flash". 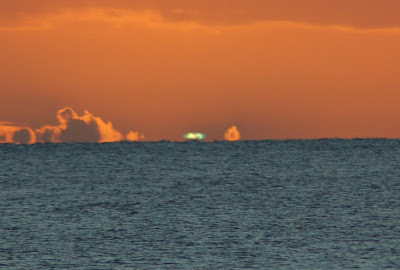 The green flash is a brief appearance of green on the horizon as the sun just disappears behind the Atlantic Ocean in this case. There is a scientific explanation as well but I will not go into it here. But I didn't see it, it didn't happen last night. According to my friends there was a really good one two nights earlier. Such is life. Anyway it was still very pleasant sitting on the beach, listening to the waves crashing on the rocks and watching the sun slowly set. It was a pretty sunset, lots of yellow and oranges and a few fluffy clouds. It was also really nice to chat with people in such a pretty and relaxed environment. While we talked, the children dug a big, big hole - a shortcut to China? W.a.i.t.i.n.g for the "Green Flash"!